In the information age, you can do everything from ordering groceries to pursuing a college degree from an accredited university online. Your money has moved online too, thanks to your financial institution’s secure websites and apps, allowing you to make transfers and pay bills anywhere and anytime you need to. If you need a loan for one reason or another, the ability to apply online eliminates the need to leave the house, but it may seem a bit risky given the gravity of the decision. Is it a good idea to apply for a loan online? Let’s take a look. Before you fill anything out, you need to consider your financial standing and aspirations. Lucy Lazarony of Credit.com recommends that your first step should be to check your credit score to determine if you are in a position to be approved for a loan. If your credit score is weak, you may have your application denied outright or be hit with a higher interest rate. If it’s not imperative that you receive the money right away, take time instead to build your credit score so you can have a higher chance of finding a loan with a reasonable interest rate. You’ll also want to consider how much money you’ll need and what you need it for, which could impact the kind of loan for which you apply. 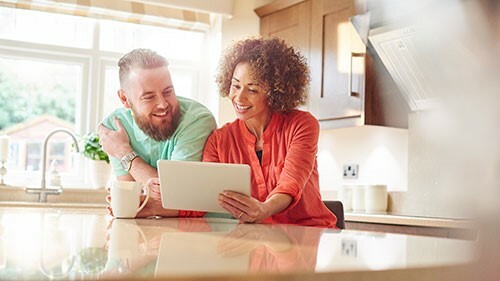 If you need some extra cash-on-hand for a renovation or addition to your home, for example, you may be better suited for a home improvement loan than a personal loan. Use your financial institution’s website to check the loan packages available to you and determine which best suits your situation and needs. Once you have a loan picked out, you’ll want to gather essential information that will be key in the lender’s final decision. Lazarony suggests having your monthly rent or house payment amount, the name of your employer and employment history handy as you may be asked about them on the application. Then it’s as simple as going online, filling out the application completely, submitting it and waiting for your approval. Is it better to apply in person? You may notice that the steps required to apply for a loan online are quite similar to those necessary to apply in person. That’s because there is often no difference: A financial institution’s online loan application process is typically identical to its process for handling loans filled out in a branch. Because there are often no differences between the two, applying online tends to be the best choice if you’re confident about your chances for approval and the loan you’ve selected. If you have questions, however, visiting a financial institution in person is likely the best way to go. While you can consult with customer service representatives online or over the phone, you’re liable to receive the most comprehensive answers to your questions by having a face-to-face meeting with a representative. Whether you apply online or in person, it’s important to approach a financial decision as significant as taking out a loan with the proper degree of respect. Do your diligence, weigh your options and only pull the trigger if everything fits your circumstances and lines up with your goals.